We are in the month of Elul! We are fast approaching in Greco Roman time the equivalent of the midnight hour. 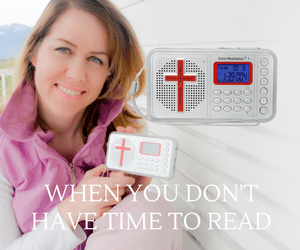 God is not on our timeclock we are on His schedule. According to His calendar/timeclock the new year is about to begin with the fall feasts fast approaching. Be sure and join us either live or live-streaming for all events! We have the Fair upon us as well as our annual Labor Day Picnic. 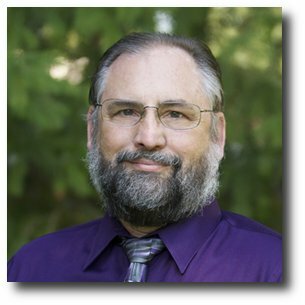 While many experts are declaring financial catastrophe this coming September-October time frame, I talked about it years ago and stated it in the book “Blood Moons Decoding the Imminent Heavenly signs” particularly on pages 165-168. We find in: Genesis 41:1 And it came to pass at the end of two full years, that Pharaoh dreamed: and, behold, he stood by the river. We need to be watchmen who are aware of the signs of the times. This has the potential to be one of the most auspicious signs yet. We are about to enter into a new seven-year cycle. As I wrote in my best selling book “Blood Moons – Decoding the Imminent Heavenly Signs” we need to be on God’s calendar if we are to have an understanding of the times we are living in. This is 3 ½ years. Revelation 10:7-10 But in the days of the voice of the seventh angel, when he shall begin to sound, the mystery of God should be finished, as he hath declared to his servants the prophets. And the voice which I heard from heaven spake unto me again, and said, Go and take the little book which is open in the hand of the angel which standeth upon the sea and upon the earth. And I went unto the angel, and said unto him, Give me the little book. And he said unto me, Take it, and eat it up; and it shall make thy belly bitter, but it shall be in thy mouth sweet as honey. And I took the little book out of the angel’s hand, and ate it up; and it was in my mouth sweet as honey: and as soon as I had eaten it, my belly was bitter. And he said unto me, Thou must prophesy again before many peoples, and nations, and tongues, and kings. But now let’s look at our critical chapter from Daniel 12 so we keep everything in context and compare it with what we read in Revelations! 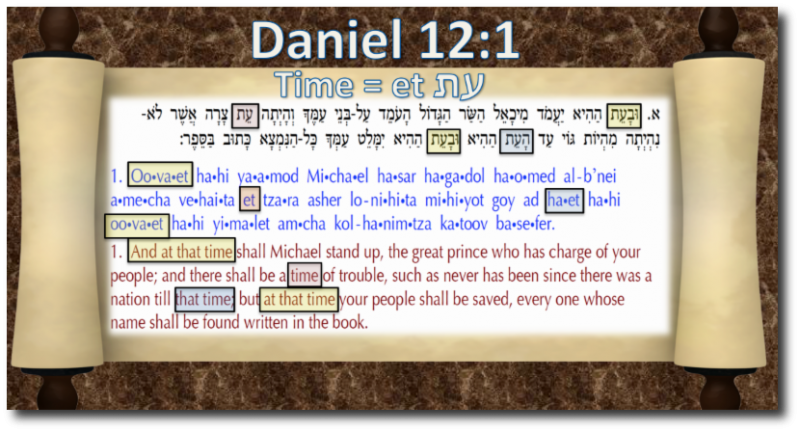 Daniel 12:1,2 And at that time shall Michael stand up, the great prince which standeth for the children of thy people: and there shall be a time of trouble, such as never was since there was a nation even to that same time: and at that time thy people shall be delivered, every one that shall be found written in the book. And many of them that sleep in the dust of the earth shall awake, some to everlasting life, and some to shame and everlasting contempt. Again it is the Hebrew word עת. Daniel 12:5-7 Then I Daniel looked, and, behold, there stood other two, the one on this side of the bank of the river, and the other on that side of the bank of the river. And one said to the man clothed in linen, which was upon the waters of the river, How long shall it be to the end of these wonders? And I heard the man clothed in linen, which was upon the waters of the river, when he held up his right hand and his left hand unto heaven, and sware by him that liveth for ever that it shall be for a time, times, andan half; and when he shall have accomplished to scatter the power of the holy people, all these things shall be finished. 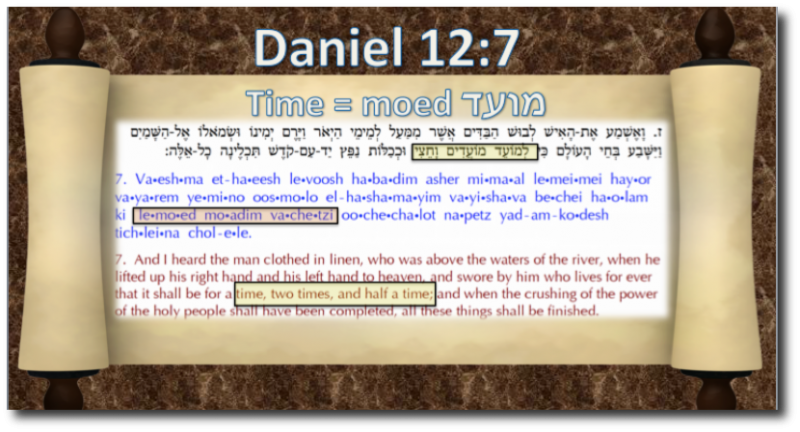 What Hebrew word is used for time/times these times? The Hebrew word is different!! It is moed: מועד Wow, wow, wow!! 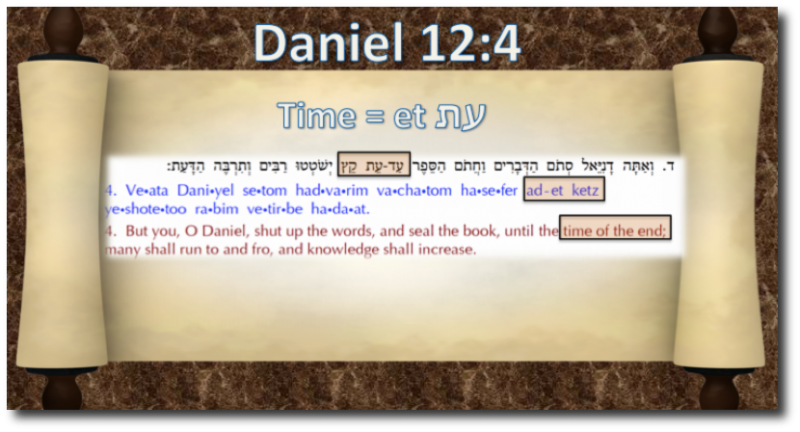 Why did Daniel specifically use a different Hebrew word unless he wanted to convey a different meaning! Six different times he used one Hebrew word but now a different one! The word refers to the feast days or the appointed times! Revelation 12:1,2 And there appeared a great wonder in heaven; a woman clothed with the sun, and the moon under her feet, and upon her head a crown of twelve stars: And she being with child cried, travailing in birth, and pained to be delivered. This takes us right back to the feast days or the moeds as to why God created them in Genesis 1! This is referring to God’s calendar! Daniel 12:9-13 And he said, Go thy way, Daniel: for the words are closed up and sealed till the time of the end. Many shall be purified, and made white, and tried; but the wicked shall do wickedly: and none of the wicked shall understand; but the wise shall understand. And from the time that the daily sacrifice shall be taken away, and the abomination that maketh desolate set up, there shall be a thousand two hundred and ninety days. Blessed is he that waiteth, and cometh to the thousand three hundred and five and thirty days. But go thou thy way till the end be: for thou shalt rest, and stand in thy lot at the end of the days. So what do I make out of all this? I do believe the tribulation is 7 years long. I do believe the time, times and a half time in Revelation refers to 1,260 days or 3 ½ years. #1 It could be referring to the last 3 ½ weeks from Rosh Hashanah to ½ way through the feast of Sukkot of the final year when it will hit critical mass. #2 It is definitely referring to the importance of the body Messiah in realizing everything is connected to the feast days! 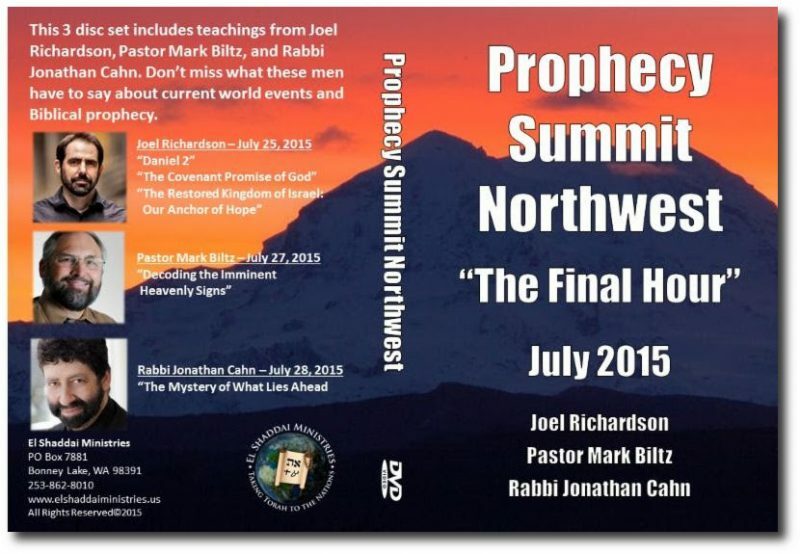 DVDs of the Prophecy Summit are now available! Visit the Webstore to buy the set.